When we bought our house in Skaneateles, it came with the appliances, including a built-in microwave oven with some unusual features. For one thing, it turned itself on. A repairman said that was probably the circuit board getting ready to go, “and that’s really expensive.” If we had chosen to call a witch doctor, I’m sure he would have diagnosed it as ‘evil spirits,’ adding “and that’s really expensive.” So last week, when the machine flatly refused to turn off after Laurie’s sister boiled water for tea, we decided to start fresh. For esthetic and practical considerations, the new microwave had to fit into the hole over the stove left by the old one, and the same-sized model was available only at one store in Auburn, six miles and one world away from the Village of Skaneateles. Auburn is home to the nearest Walmart, the nearest urban blight, and it has an interesting past with regard to electricity. Other Auburn luminaries include Leon Czolgosz (Class of 1901, electrocutee #50), who assassinated President William McKinley, also in Buffalo, and got a remarkably speedy trial (and a series of impromptu beatings) in the weeks thereafter, and a certified cad, Chester Gilette (Class of 1908), who drowned his pregnant girlfriend in Big Moose Lake and tried to pass it off as a suicide thus inspiring Theodore Drieser to write An American Tragedy and providing a cautionary tale for those women who would otherwise be prey to smooth-talking beaus. The electric chair was built in Auburn Prison by an Albany lobbyist who had been hired by Thomas Alva Edison to publicize how dangerous Alternating Current (AC) was. Edison knew Direct Current (DC) was inferior to competitor George Westinghouse’s AC, but he attempted to destroy his competitor rather than adapt to the better idea. He was the Bill Gates of his time. The electric chair presented a wonderful opportunity to Edison. If the state killed people with AC, who would want that lethal current in their homes? To illustrate the point, Edison and his henchmen toasted dogs and cats, two calves, a 1230 lb. horse, and an orangutan (and what an afternoon that must have been) before getting on to William Klemmer. Ultimately, the fright campaign failed and Edison eventually admitted he knew AC was better all along. But years later, we remember him kindly for the light bulb and phonograph, instead of as the vicious, lying, Hell-baked reptile he truly was. But I digress. The source of our new nuker in Auburn was Riester’s General Service. Upon opening the door, we were confronted by the usual white rows of washers, dryers and refrigerators, but there were red, white and yellow model airplanes hanging from the ceiling, and some shelving with family photos, knick knacks and brochures for a local church. This place had Mom & Pop written all over it. Mom was busy, but a young man emerged from the back and through a mouthful of food asked if we needed help. He disappeared in search of another young man, Mike, who directed us to our choice of one microwave, which was of course bigger than our old one, but had a new button that says “Popcorn” which made it okay. When we recessed to the office doorway to conclude the deal, the family cat came in carrying something that I feared from the color of the fur and the line of the haunch was not a kitten. My fears were realized when the cat dropped a young rabbit on the stairs. This trip was not the rabbit’s idea, and of that I am sure. The bunny was still alive but had the look of a condemned man waiting for the governor’s call. I said, “Don’t look,” to Laurie who turned right around and said something like, “eeeoouu,” which in turn prompted Mom to say, “Why’d you let the cat in with a rabbit? !” to Pop, who took off his hat and scratched his head (because if you’re a husband, you know there’s just no good answer to that question) as the cat picked up the rabbit and ran for it. There was a commotion behind the stoves, then Mom scooped up the cat and carried him vertically back our way with a “Busted!” look on his face, and the guy who was looking for our microwave on the computer now gave chase to the rabbit who threw an ear fake towards the refrigerators and then ducked hard for the cellar stairs, and made it. “They carry rabies, you know,” said Mike, who went on to describe how he had once cared for three baby raccoons who “bit the heck out of me.” We finished the transaction, and as we left, a young woman with blonde hair drawn back carried in two pizzas. Everybody was bringing something to eat to Riester’s. The microwave was installed two days later by a wonderfully competent and neat service person. The Popcorn button works great. Laurie has already been back for a lint filter for the Maytag. We just can’t wait for our next appliance to break. In July 2006, a reader of the above chided me for failing to recognize the contribution of Alfred P. Southwick, a Buffalo, N.Y., dentist, his choice for the real inventor of the electric chair. On August 7, 1881, Southwick witnessed the death of George Smith who stumbled into a generator, was electrocuted and died instantly. Southwick thought electrocution would be a more humane method of execution than hanging, and discussed the matter with Dr. George Fell, also of Buffalo. The two approached the local SPCA and arranged to experiment on the city’s stray animals. In 1882, Southwick and Fell began electrocuting cats and dogs, taking notes, and publishing their findings. Southwick then approached a friend in the New York State Senate, Daniel MacMillan, who was an advocate of capital punishment. If electrocution was quick and painless, it could undercut the annoying arguments of those who claimed that execution was inherently cruel and painful. Senator MacMillan took Southwick’s ideas to N.Y. Governor David Bennett Hill. In 1886, Hill appointed a “Commission to Investigate and Report the Most Humane and Practical Method of Carrying into Effect the Sentence of Death in Capital Cases.” Southwick, Matthew Hale, and Elbridge Gerry made up the committee, known variously as the Gerry Committee or the Death Commission. Southwick was advocating electricity from the first. Physicians, who were trying to gain public acceptance of hypodermic needles, endorsed the electric chair idea to steer the committee away from lethal injection. In 1888, the committee reported that electrocution was the best option. This prompted a bill, which passed on June 4, 1888, officially selecting electrocution. All that remained was to decide whether electrocution would be by Alternating Current (AC) or Direct Current (DC). The governor left that decision to another committee, this one chaired by Dr. Fred Peterson of Columbia University, who was also on Thomas Edison’s payroll. Edison, as noted above, had been working hard to link AC with death in the mind of the public, solely to protect his own investment in DC technology. In 1887, his staff collected reports of deaths involving AC in a pamphlet called “A Warning.” With reporters present, Edison conducted demonstrations at his laboratory in West Orange, New Jersey, killing cats and dogs by luring them onto a metal plate wired to a 1,000 volt AC generator. In 1888, after Harold P. Brown, a former Edison employee, wrote a letter to the New York Post decrying yet another death by electrocution, Edison re-hired Brown. New York’s selection of electrocution for executions gave Edison a new front on which to wage his battle, and Brown led the charge. State officials sponsored a statewide tour of the electric chair prototype. Animals were recruited in all of the major population centers and Harold Brown flipped the switch. The orangutan I mentioned above was executed in the state capital, Albany, where the audience was treated to the spectacle of the ape’s hair bursting into flame. Enter murderer William Kemmler, noted above. He went to trial in Buffalo in May 1889 and was convicted of murder. On May 13, Judge Henry Childs sentenced Kemmler to death. However, a stay was granted, based on an appeal filed by prominent attorney W. Bourke Cockran. Many were surprised that Cockran was taking interest in Kemmler, but it was soon revealed that he had been hired by George Westinghouse, who, needless to say, did not want his family name intimately associated with death. Another judge, Edwin Day, appointed attorney Tracy C. Becker to conduct hearings exploring Cockran’s claims that electrocution was unpredictable, unreliable and cruel. The State’s star witness, none other than Thomas Alva Edison, took the stand on July 23. Edison testified that as long as sufficient voltages were used, the electric chair would work quickly and humanely. He said that those voltages should be delivered via AC and, of course, cited Westinghouse generators by name. Harold Brown also testified, underscoring Edison’s points. Judge Day ruled in favor of the state, but Cockran took the case to the New York State Court of Appeals. Cockran lost, but Westinghouse hired another attorney, Roger Sherman, who took the case to the U.S. Supreme Court, where the appeal was denied for the last time. At Auburn prison, an execution chamber was readied in the basement of its Administration Building. Early in the morning on August 6, 1890, William Kemmler was subjected to 1600 volts of electricity. Operating the Westinghouse AC generator was the ever present and always helpful Harold Brown. After 17 seconds, the current was turned off, and all the witnesses thought Kemmler was dead. Which leaves us with the question of who was the chair’s inventor. Alfred Southwick first had the idea of using electrocution as a method of execution, and, with George Fell, put many animals to death. Harold Brown and Fred Peterson experimented with electrocution at Thomas Edison’s laboratories, at Columbia University and in many cities of New York State. Harold Brown was said to have assembled the chairs at all three New York prisons. 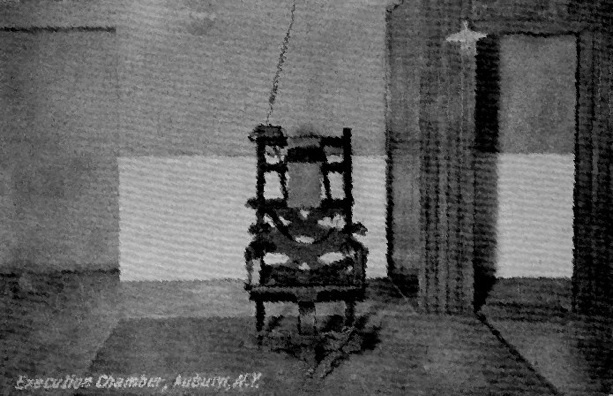 Others credit Edwin R. Davis, the Auburn Prison electrician, for the construction and testing of the Auburn chair. Davis, however, began his career as Harold Brown’s assistant. One source notes that Carlos McDonald and A. P. Rockwell also contributed to the engineering of the chair, drawing up the first detailed plans. The patent is registered to Edwin Davis, who referred to himself as “The Father of the Electric Chair” and used it to kill more than 300 prisoners. Southwick, Fell, Brown and Davis were all present and assisting at the first electrocution. The warden, Charles Durston, gave the signal to Davis, the executioner, who threw the switch. You decide for yourself. The only dog I have in this race is the one running away from Thomas Alva Edison, as fast as his feet can carry him. In March of 2008, I was chided once again, by a reader who noted, “Dr. Southwick DID NOT see Mr. Smith die at the Buffalo site; he had heard what happened from his friend, Dr. Fowler, who performed the autopsy on Mr. Smith. I have done research on this topic for my Criminal Justice Degree.” I believe you.